Big, menacing waves roll towards the Dorset coast. On the cliffs, cows munch grass in the green fields, oblivious to the drama set to unfold out at sea. In the west, the skies are leaden. Portland Island is a brooding hulk. HMS Bulwark, on guard duty, is a silhouette offshore. In the distance, the thin strip of buildings on Weymouth's Esplanade shines like a white belt between the grey sea and sky. Out in this heaving swell on Weymouth Bay, white-capped by the whining wind, men in small dinghies are tossed about. Now you see them, now you don't, as they rise and fall with the waves. But they are no ordinary men. Or dinghies, for that matter. The Olympic Finn class is preparing to renew battle. Britain's Ben Ainslie is under pressure to get his quest back on track for a fourth Olympic gold. His nemesis, Dane Jonas Hogh-Christensen, is out here somewhere, trying to defend his lead. An armada of blue or orange ribs with cameramen, marshals or TV pundits bob and spin as they jockey for position near the blue-hulled committee boat. The black, raked-back carbon masts and high-tech laminate sails of the one-man Finn sway from side to side, like triangular flowers buffeted in the breeze. The sailors, in bulky team anoraks to keep warm until the last minute, circle, awaiting the start. Sails flog as the boats turn, rigging thrums in the wind, ribs smack off waves, their engines whirring. A hooter adds to the cacophony, and the huge digital clock clamped to the mast of the committee boat begins to click down from 5:00. The five-minute gun. Tension ramps up. Beyond the committee boat is the "pin", a smaller boat with a matching orange mast to denote the far end of the start line. Some sailors cruise the line, surveying the best route out. Ainslie glides past, looking around. Who for? Need we ask. If it's the Dane, he is in his own space, way out beyond the pin end. The blue and white square of the "Blue Peter" flag goes up on the committee boat. That's four minutes to go. The Finns dart and weave, their white wakes leaving intricate patterns in the gunmetal swell. One minute to go. The Blue Peter comes down. "Come on Benjamin, England expects," mutters veteran yachting journalist Bob Fisher. He means Britain, of course, but paraphrasing Nelson's famous message seems appropriate. Ten seconds, nine, eight… the fleet nudges towards the line, stalling, sails flapping, careful not to cross early. A penalty turn could be costly. Ainslie heads for the pin end and punches out first in clear air, chasing the left side of the course. Hogh-Christensen gives chase. The tightly packed fleet, with taught sails shining in the weak sun, strain for an advantage as they bounce and bash upwind towards a distant mark. Taking their place around the start line, the two-man Star class keelboats begin their dance. They are like graceful white swans compared to the pugnacious little Finns. Their keels shine as they slice through the water, the two white sails spread like the wings of the soaring gulls above. 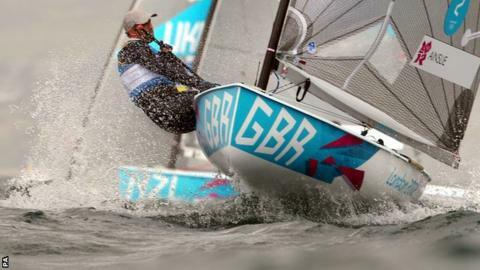 British sailor Iain Percy - there he goes now, snuggled on the side of his boat next to team-mate Andrew Simpson - is chasing his own Olympic glory. He's often overlooked by the Ainslie-obsessed mainstream, but victory in Weymouth would make it three golds in four Games. And Percy and Simpson have got a lead to protect. The start sequence begins - the Star class flag, the Blue Peter and the countdown. But there is a whole pack who can't contain themselves and egg each other over the line. That's a general recall. A black flag goes up. Not pirates, but a warning. Next boat over is out. The Finn sails are no more than needles on the horizon now. But this is the mobile phone Games and the action is on the small screen, shielded from sun and spray. "That was a really good opening statement from Ainslie - he wanted that left hand side," says BBC commentator Richard Simmonds. "He will feel he has to beat the Dane here." "Perfect execution - what a start to nail," says two-time gold medallist and BBC pundit Shirley Robertson. Ainslie rounds the first mark ahead, with Christensen in fifth. Sailing back downwind, they wait for a wave and then "pump" the sail, giving it a hefty yank to make the boat pick up speed and surf down the face. They weave constantly, trying to pick up the swell. "It is precarious," says Simmonds. "It's rock and roll. And it's easy to roll in. Whoever you are." Hogh-Christensen is on a charge, picking off boats with his strength and technique. But then disaster. He rolls in, as Simmonds predicts. Advantage Ainslie. The Dane scrambles to get his boat back upright and continue racing. Back to the action in front of us, the Stars get away this time. The fleet splits left and right, depending on where they think the best wind is. Percy and Simpson, the Union Jack and "GBR" on their mainsail, go up the middle. Off to the left, out of the silvery shimmer, Ainslie hoves into view. "That's one of the greatest sights in sailboat racing - Ben Ainslie in the waves," says Fisher. The Briton sluices and surfs his way towards the large inflatable orange buoys denoting the gate - the bottom or downwind mark - they must go through. With a shove of his tiller, the nose of his Finn comes around towards the wind, he pulls in the sail and trucks back up the course. The fleet follow, bustling each other around the left or right mark. There's the red and white Danish flag of Hogh-Christensen in 10th. The capsize cost him 30 seconds, plus a lot of energy. The Finns get smaller again and the Stars glide downwind. Shouts come from various boats as the crews jostle around the mark, the manoeuvres, rope-work and communication well-oiled after years of practice. The long, slender hulls slice through the waves and get smaller as they head back towards the windward mark. But coming the other way, on the neighbouring Finn course, a small sail gets bigger as it rolls and yaws closer. It's Ainslie, still in front, still squeezing the maximum speed out of his Finn. The fleet is strung out behind. He rounds the final downwind mark and points left for a short reach across the wind to the finish. Crossing the line, he pumps his fist up and down, not once but numerous times. Britain expected and Ben delivered. He looks back. The Danish sail is way behind in eighth. It's Ainslie's first win of the week. And he's taken a big chunk out of Hogh-Christensenl's lead. The waves still roll in and the wind still whistles. The cows go on munching. But Ainslie is back in the game. And Percy won, too.